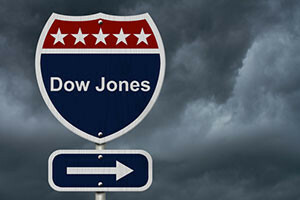 The Dow Jones Industrial Average fell today (Monday) despite a solid jump in oil prices and energy stocks. The Russell 2000 also snapped a 15-day winning streak as the Donald Trump election rally slowed. A downturn in the U.S. dollar pushed crude prices higher and sent gold prices higher. The Dow Jones fell 54 points on a decline in banking and consumer discretionary stocks and a slump in the U.S. dollar. Gold prices have been under extreme pressure in recent weeks thanks to the surging U.S. dollar, but today's downturn in the greenback pushed gold prices up more than 1% on the day. Looking forward, gold's recent price weakness is creating a buying opportunity for investors. Money Morning Resource Specialist Peter Krauth offers his 2017 gold price forecast, right here. The dollar slide contributed to a difficult day for banking stocks, with Wells Fargo & Co. (NYSE: WFC) dropping 1.2%, Citigroup Inc. (NYSE: C) dropping 1.6%, and Bank of America Corp. (NYSE: BAC) dropping 1.9%. The Federal Reserve was once again in focus as investors continue to speculate on the timing of the next interest rate hike. According to CME Group's FedWatch Tool, the probability of another rate hike in December sits at 95.9%. But we've seen the Federal Reserve change its mind at the last minute several times in 2016. The last time that the central bank increased rates was in December 2015. Will we see a repeat next month at the December FOMC meeting? We answer that question, right here. The price of crude oil climbed as investors eye the probability of a deal by OPEC later this week. Optimism is growing for a deal among members of the world's largest energy cartel after Iraq's oil minister said they will cooperate with other nations to reach a deal. In recent months, reports indicated that Iraq wanted an exemption from any deal. The WTI crude oil price today added 2.0%, while the Brent crude oil price gained 1.9%. Money Morning Global Energy Strategist Dr. Kent Moors has explained that the deal is under pressure because of dramatic changes in the global oil markets in recent years. Be sure to read his latest insight on the OPEC deal, right here. But the big news today is Cyber Monday. Today is the biggest online shopping day of the year in the United States. Once again, investors were keeping an eye on Amazon.com Inc. (Nasdaq: AMZN). Shares of AMZN stock slumped nearly 2% during the busy shopping day. Despite expectations that the company will reach a new record for orders, investors are questioning the company's margins as it slashes the price of its technology products. Shares of United Parcel Service Inc. (NYSE: UPS) fell 0.6% although the company's CEO said the firm met its shipment expectations for Black Friday. The company is expecting a huge swell in shipments during this holiday season thanks in part to the ongoing shift toward online shopping. Brick-and-mortar shops like Wal-Mart Stores Inc. (NYSE: WMT), Target Corp. (NYSE: TGT), and Nordstrom Inc. (NYSE: JWN) were trading flat as the data from Friday's sales continued to roll in. Money Morning breaks down the performance of five stocks to watch after Cyber Monday. Shares of Time Inc. (NYSE: TIME) rallied more than 16% on news that the media giant turned down a buyout from Edgar Bronfman for $18 per share. According to news on the deal, the private equity manager had partnered with Israeli businessman Ynon Kreiz and Access Industries to secure capital for a deal. Shares of Panera Bread (Nasdaq: PNRA) fell more than 2% after the company received a stock downgrade from "outperform" to "neutral" from investment firm Wedbush. After the bell, look for additional earnings reports from Shoe Carnival Inc. (Nasdaq: SCVL) and 21Vianet Group Inc. (Nasdaq: VNET). New York Federal Reserve President William Dudley speaks at 9:15 a.m.